Between birth and his second birthday, your baby will grow an amazing amount. During the year leading up to your child's third birthday, you can expect him to grow another two to three inches and gain an additional four pounds, according to KidsHealth. Knowing the average height and weight for your 2-year-old will help you know whether your child is developmentally on track. Toddlers who fall outside the averages can be perfectly healthy, too, but talk to your child's pediatrician to be sure. Is His Weight Normal ... or Not? A 2-year-old boy, at the age of 24 months, weighs an average of approximately 28 pounds, which means he's in the 50th percentile, according to the Centers for Disease Control and Prevention. A 2-year-old girl, at the age of 24 months, weighs an average of 26.5 pounds, the CDC reports. Two-year-olds who fall above or below the 50th percentile are still considered healthy and normal. As long as your toddler is growing at a steady pace, chances are he's healthy. A 2-year-old who weighs much less or much more than the averages can experience certain health problems, however. Certain medical and genetic problems can inhibit growth, according to KidsHealth. A toddler who weighs more than normal is at an increased risk for diabetes, heart disease, high blood pressure, high cholesterol, sleep apnea, bone problems and early puberty, the University of Michigan Health System reports. A 2-year-old who weighs much less than average, on the other hand, can experience vitamin and mineral deficiencies that decrease overall health and well-being. A 2-year-old boy, at age 24 months, is an average of 34.5 inches tall, and is in the 50th percentile, according to the CDC. A 2-year-old girl, at age 24 months, is an average of about 34 inches tall. Your toddler's exact height can vary, however, especially if you and your partner are very short or very tall, according to the KidsHealth website. 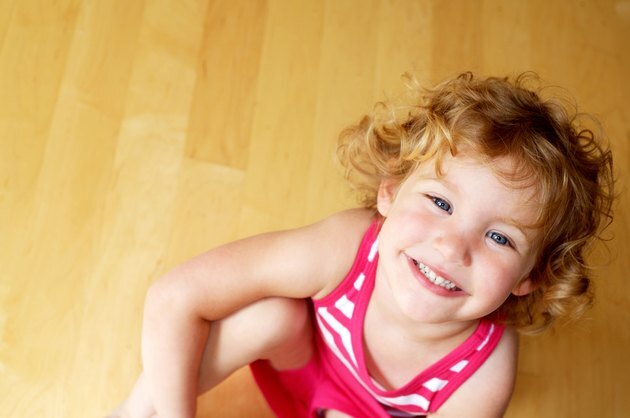 Your 2-year-old may fall outside the average height because she's genetically predisposed to be quite short or quite tall because it runs in the family. A child who is very short for her age might be diagnosed with failure to thrive, which puts her at an increased risk for nutritional deficiencies. If your child is gaining weight at a faster or slower rate than she's growing in height, it's a cause for concern, KidsHealth notes. If this is the case, speak with your child's pediatrician about what treatments and options are available to get her back on track. What Is a Healthy Weight for a 13-Year-Old?